The inestimable Michael Ripplinger once pointed me to this video (that granted is aimed at a tech audience) at one of the many times when I was feeling overwhelmed in the past year. It was the right thing for me to hear both then and now. The gist is this: when you have a purpose, stick to the things that will further that purpose. For example, if you want to be a writer, write. Don’t spend all day every day reading other’s fiction, trying to find the best tools, getting the perfect location setup, and reading *gasp* blogs. Spend the majority of your available time actually NOT doing those things. Now allow me to charm you with a “don’t” GIF of Andre the Giant. No, I’m not quoting a song intentionally. It just came out that way. I’ve been inordinately busy of late. I won’t make excuses. Just know that if I could have taken the time and energy to keep my Tuesday/Friday cadence going, I would have. Now, let’s get back on track with a short post. Spending a few days in San Francisco on business is a boon I needed badly. Free time is at a premium due to hours of talks in hotel conference rooms, however, just feeling the hum of the city and seeing, hearing, AND smelling the masses of humanity here is exciting. Yes, I live in Salt Lake, but it isn’t the same. I’m in love with the concept of a walkable city where one doesn’t need to own a car. There aren’t many like it in the U.S., but San Fran is eminently walkable. I took the BART from the airport to downtown and walked everywhere. It is not only energizing, but it’s also enlightening. I’ve learned I’m out of shape, for one. I remembered that people come in a lot more varieties than generally show up in Utah. Also, I discovered that a lot of people here smoke weed walking down the street on their way home from work in the financial district. Blew my mind. The world is an ever-changing place. On my walking trips, I spotted a dozen neat little shops, but the one that caught my eye was a hat shop filled with fabulous hand-crafted hats. As is my standing tradition, I bought one. It is lonely and somewhat depressing to be away from family. Though sitting in a utilitarian hotel room and writing at night, with only the hum of the city to keep you company, does provide plenty of time. All of these variations on life are experiences to capture for writing inspiration. As a writer, I cannot afford to be frivolous. I must never leave my most peculiar days to the dismal gray of long-term memory. Do Writing Blog Posts, Emails, And Code Count? The short answer is no. It does not count. Writing fiction is not the literary equivalent of horseshoes or hand grenades. Still, sometimes we have to fight the battles we can win. Writing anything is better than not writing at all. This week so far, I’m taking what I can get. Happy Halloween! Well, tomorrow anyway. You get the idea. Behold! A flash fiction story in the world of Rue From Ruin. It is not an official part of the story, but it is intimately related to it. I repeat, this IS NOT RFR – Part 5. If nothing else, it’s a bit more light-hearted than Rue. It also has a different protagonist. Thanks as always to my lovely sounding board, Meri, and also to my good friend Michael Ripplinger, for keeping me from publishing an unreadable Halloween nightmare of crappy writing. At any rate, it was an absolute blast to write. Perhaps Gross Misuse is the start of a new tradition on the blog. Flash fiction for Halloween in the world of one of my longer stories. It was usually quiet here. I remember the first time I was placed in my dark, narrow home with my brothers. So cozy. The cleanings once happened regularly. Strong chemicals were employed, removing the buildup of time. But those days were gone, and it had been some time since the people in gray and white had come. My siblings and I were no longer our spotless and shiny selves. There is absolute despair in disuse. Always lying still; never called upon for the job for which you were made. Though – I would never have wished for what happened this day. The day passed slowly like any other but pass it did. The light of it bled through a crack in the door to our darkened home. I longed, as always, to be brought out into that light. The world needed to know I hadn’t lost my edge. When night fell, my brothers and I lay in silence as our domicile returned to nearly complete darkness. We heard a crashing noise, quite strange after what seemed like ages of stillness. It startled me, but, of course, I could not jump. It is not in my nature to do so. A terrible snarling followed the crash, and a high pitched sound howled into the night. My home was torn from its enclosure, and everything I knew was turned upside down. The violence of this sudden eviction was such that my brothers and I flew from our confined space. Our oddly-shaped cousins from neighboring homes met us in mid-flight. The sound of our meeting was a cacophony of tinkles, clangs, and clinks. During that split second in mid-air, I wondered if I would be stuck somewhere at the end of my impromptu flight. Would I be left, dulling, half embedded in some weaker material? No. That was not to be my fate. A strange, strong grip plucked me out of the air. It was firm and rough; more so than any hand that had held me before. It also seemed to… smoke. That’s probably not the right word. It was like I was made of dry ice and evaporation was squeezing its way out from between where we touched. Having been forged at over nine hundred degrees Celsius, I knew it wasn’t I releasing the foul-smelling vapor into the air. The hand seemed to tremble as if in pain but tightened its grip in response. It bubbled a wet and putrid ooze against me. The hand’s owner ran, chasing a second form at the edge of sight. The figure was difficult to make out at such high speed. I caught a glimpse of my captor as he wiped his scruffy face with the back of his arm. We had burst out into the moonlit night, and his rough features were mostly visible. He was hairier than most men I’d seen. Unkempt. Something was off about him as well, but I couldn’t quite place it. There was no time to ponder the strangeness of it as my abductor sprinted and leaped to catch his prey. He slashed out powerfully with me. I found my target and reveled in the feeling of slicing through skin, flesh, gristle, and even bone. I hope you’ll pardon the cliche, but I was like a hot knife slicing through butter. The feeling was exhilarating at first. I was meant for this! Cutting, chopping, carving, slicing – but no, not into a living being. Not like this. I was an instrument of the glorious kitchen. Made for working with food, not killing things like some crude slaughterers implement. Still. I cannot deny the pleasure I felt in my heart at being put to use. It almost distracted me from the howl of pain and the stench that rose from the body I had cut. It was the same reaction that came from the seething hand that held me. I noted that there was blood on me now, and it was boiling and steaming as well. The odor sickened me. My captor leaped at his prey knocking him to the ground. He laid my frothing blade against the neck, daring the creature to move. A thin wisp of mist rose from the spot where my edge rested firmly. I couldn’t quite see my victim’s face. Its neck was enormous and was covered in unusually thick, coarse hair. This creature was even stranger and stronger than one that grasped me. I resigned myself to the fact I had become an instrument of death. I would probably end up in an evidence lockup. Then, my wielder began to speak. Perhaps this day would end without a death on my conscience after all. As a silver butter knife, I never expected to be holding onto that hope so feebly. If you enjoyed Gross Misuse and are unfamiliar with my serial story Rue From Ruin, you should check it out. I have a least three readers who think it is extra neat! It has been brought to my attention that I have failed the writing community at large because I haven’t read the Harry Potter series by J. K. Rowling (yes, I just linked to Wikipedia for Harry Potter). I will attempt to remedy this by at least reading the first installment after I finish the book I’m currently reading, Red Litten World by K. M. Alexander. 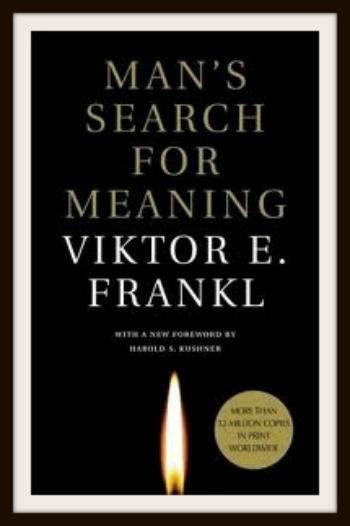 Now let me add my own, “you’ve failed the writing community if you haven’t read”: Man’s Search For Meaning by Viktor Frankl. I know- it’s an entirely different genre. It isn’t even FICTION! This book will transform the way you think about the motivations of characters in desperate situations. This book enlightens you on the motives of men driven to do horrible things. This book may well change your life for the better. It has mine. Thank you, Meri! Frankl was a Jew in a concentration camp. He saw some of the worst of the human condition imaginable. He also happened to be a trained psychiatrist who observed and later documented the ordeal. If you are a writer, read this book. If you are not a writer, read this book. I’d love to hear from you. 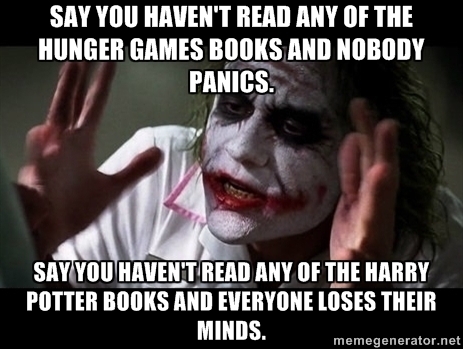 What is your “you’ve failed the writing community if you haven’t read” book? Small update: I’m still working on Rue From Ruin – Part 5. It’s difficult, but it’s worth it! If you’ve talked to me about writing this year, it should come as no surprise that I’ll be returning to LTUE (Life, the Universe, and Everything Symposium) in 2016. In February 2015, I attended LTUE for the first time, and I loved every minute. If I haven’t already, let me tell you why YOU want to attend LTUE in 2016 if you are a writer (aspiring or otherwise). Fantastic Writing Panels – panelists ranging from newcomers to international bestsellers talk every writing topic under the sun. Topics range from the science in sci-fi to worldbuilding to plot to editing to promotion to publishing (indie and traditional). Accessible speakers and panelists – this isn’t a huge convention, and there are plenty of opportunities to chat with experts (writers, editors, games designers) about their take on your questions. Meet delightful people – plenty of opportunities to connect with others with similar goals. Talk to people from all over the industry. Pitch or Crit sessions – have a chance to see what an editor thinks of your book or concept. Affordably priced – the 3-day symposium is only $45 and free for students. I don’t care who you are, that’s a steal. Anyway, come on down. LTUE is going to be fantastic in 2016. If you should happen to attend, look for me and say hi! I’d love to share thoughts and ideas with fellow writers and readers. I also found this delightful graphic as a result of attending a Dune panel last February. 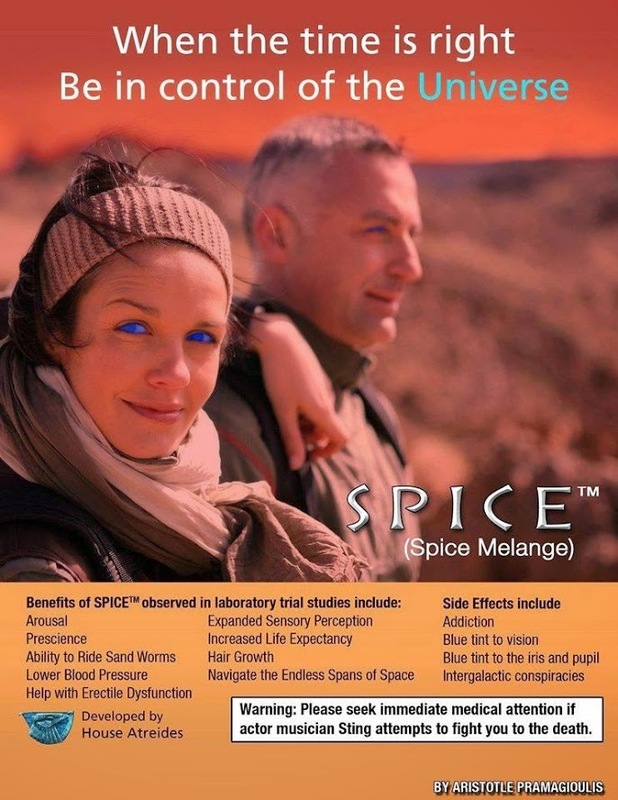 Enjoy, Dune fans.